That's why I wanted to use UDMF, but I tried to convert a few of the maps over, and ended up with doors not working, multiplayer weapons available in normal game, and other weird stuff. That was Doom format straight to UDMF, I haven't tried converting the current Hex format over to UDMF. Ill give it a go and see what happens. Just tried converting attack hexen to udmf, and it worked fine. 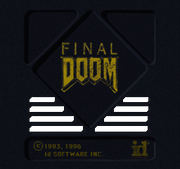 just extracted all the sounds from psx final doom iso. download! cyberdemon must have 2 walk sound states - "metal" hoof and "normal" hoof. Its a bit on the dark side but it is the right color. map1 or map61 in the main TC, sector 178 (Blue key square) is color 235 according to color lighting txt file created by the map converter fpsxmapconv. and what's this "again wrong color" patter all about, you only pointed 3 sectors out in the hole game that had the wrong color. Map 40(Refueling Base, Doom II)exit leads back to Map 40 and not map 41. Coincidentally, map 41 exit leads to the end screen. All other exits from map 01-90 work as intended. 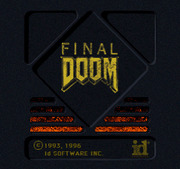 btw, check the edges of the "holes" of the doom intro graphic. some of them are semi-transperent, but there must be only 100% transperent and 100% opaque pixels. The TC is indeed using the same "copyrights" image as the PAL version, but that "TRADRMARK" error is a new typo that wasn't present in the official game. What ever happened to Mattfrie1? Even though he started this thread, I haven't seen him post here for quite some time now. I tend to lurk more than I post, but I'm extremely pleased with all of the progress that has been made on this project. Would all of you prefer the NTSC copyright screen, or would you prefer it removed? Personally, I prefer NTSC over PAL for some reasons but it doesn't really matter now. 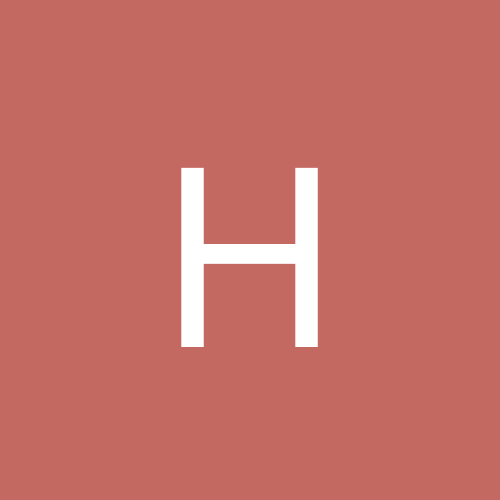 What prevents from using both PAL and NTSC screens in a rotation? 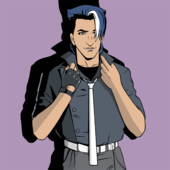 ok Iv rounded all the edges and it looks no bad in the game. If you have a look at the PSX Emu screen grab the bottom left corners do not look very round. The copyright screen is only displayed once when the game starts, I do not know how to get it to rotate between different copyright screens ever time you start the game. ScottGray sorry, you were right, I didn't notice. Include the previous pic then. The reason of using NTSC version is at least the fact that the PAL version came after NTSC one. can "licensed by SCEA" and "williams video" intro parts be included? IIRC, this feature was disabled, since it was never really used and it only ever worked on Windows (no support for it in DOS or Linux version back then; no support for it in Linux or MacOS versions now). That's a cool Idea lafoxxx, I put that into the console background, and am cool with the SCEA logo. The ntsc copyrights are in also. I had no idea zdoom could play video, I wonder if there is a way to enabled it? 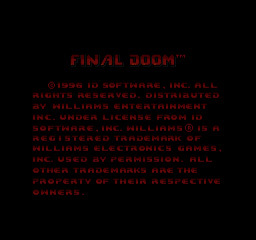 It says on zdoom wiki that it will just return MOVIE_Failed. It would be cool to have it in there. Do you still need psxmus01-20 recorded directly from the emu? Since I don't see any serious reasons for replacing existing ones (from PSX DOOM TC), I'll only be able to record them if you really need them, because it's kinda hard for me to find time for this right now. no its cool man, the existing ones are fine. 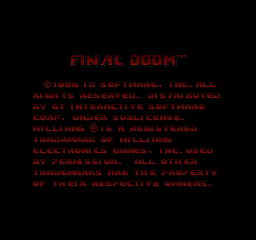 Here is the Williams intro for final doom, its animated by GZdoom, its not a movie file, so all the non windows users should be fine. 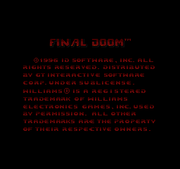 only uses this one with the final doom tc, not the main tc. 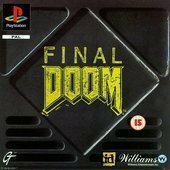 Even though I never played Doom on the PSX, so I couldn't say how faithful this is - but still, I gotta say, this is some real nice work. Why didn't I think of this? Looks great! Really great work on getting the video imported Scottgray, just checked and lafoxxx is right about the order that it's played but it's not a massive issue, would definitely like to see this imported into both the main downloads. Out of interest how feasible would it be to as well as include the Williams logo video, to also include the Playstation Bootup video? Damn this is pretty cool, never seen anyone do this type of thing before, great job.